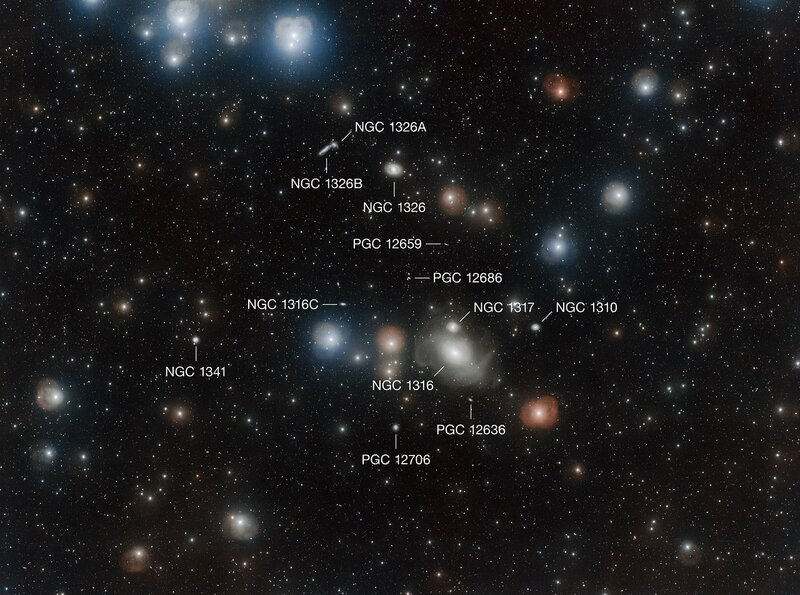 Perhaps the most fascinating member of the cluster is NGC 1316, a galaxy that has experienced a dynamic history, being formed by the merger of multiple smaller galaxies. The gravitational distortions of the galaxy’s adventurous past have left their mark on its lenticular structure . Large ripples, loops and arcs embedded in the starry outer envelope were first observed in the 1970s, and they remain an active field of study for contemporary astronomers, who use the latest telescope technology to observe the finer details of NGC 1316’s unusual structure through a combination of imaging and modelling. The mergers that formed NGC 1316 led to an influx of gas, which fuels an exotic astrophysical object at its centre: a supermassive black hole with a mass roughly 150 million times that of the Sun. As it accretes mass from its surroundings, this cosmic monster produces immensely powerful jets of high-energy particles , that in turn give rise to the characteristic lobes of emission seen at radio wavelengths, making NGC 1316 the fourth-brightest radio source in the sky . NGC 1316 has also been host to four recorded type Ia supernovae, which are vitally important astrophysical events for astronomers. 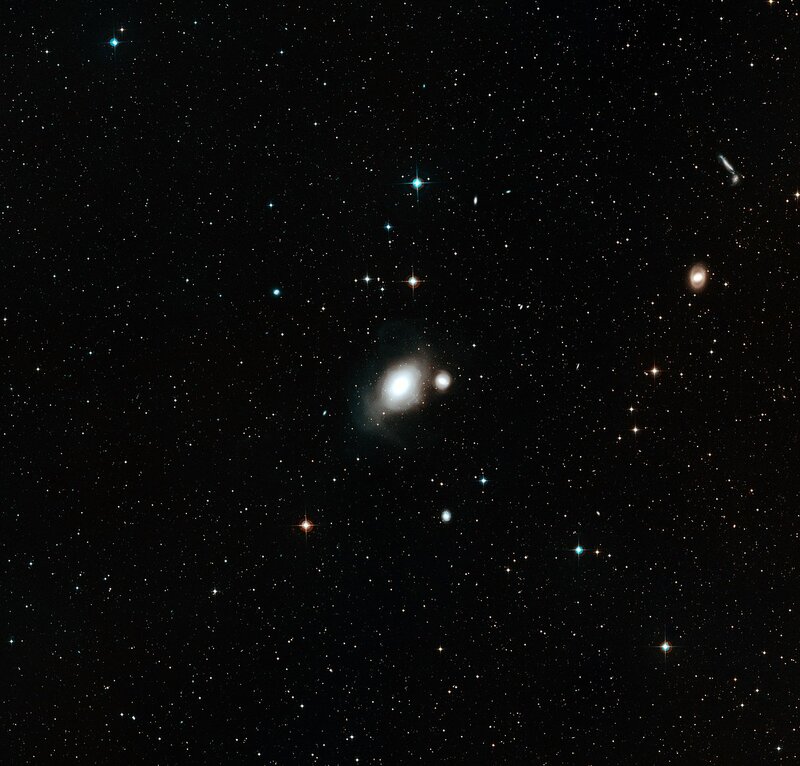 Since type Ia supernovae have a very clearly defined brightness , they can be used to measure the distance to the host galaxy; in this case, 60 million light-years. These “standard candles” are much sought-after by astronomers, as they are an excellent tool to reliably measure the distance to remote objects. In fact, they played a key role in the groundbreaking discovery that our Universe is expanding at an accelerating rate. This image was taken by the VST at ESO’s Paranal Observatory as part of the Fornax Deep Survey, a project to provide a deep, multi-imaging survey of the Fornax Cluster. 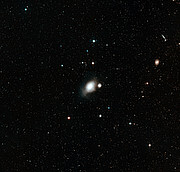 The team, led by Enrichetta Iodice (INAF – Osservatorio di Capodimonte, Naples, Italy), have previously observed this area with the VST and revealed a faint bridge of light between NGC 1399 and the smaller galaxy NGC 1387 (eso1612) . The VST was specifically designed to conduct large-scale surveys of the sky. With its huge corrected field of view and specially designed 256-megapixel camera, OmegaCAM, the VST can produce deep images of large areas of sky quickly, leaving the much larger telescopes — like ESO’s Very Large Telescope (VLT) — to explore the details of individual objects. Type Ia Supernovae occur when an accreting white dwarf in a binary star system slowly gains mass from its companion until it reaches a limit that triggers the nuclear fusion of carbon. In a brief period of time, a chain reaction is initiated that eventually ends in a huge release of energy: a supernova explosion. The supernova always occurs at a specific mass, known as the Chandrasekhar limit, and produces an almost identical explosion each time. The similarity of type Ia supernovae allow astronomers to use the cataclysmic events to measure distance. 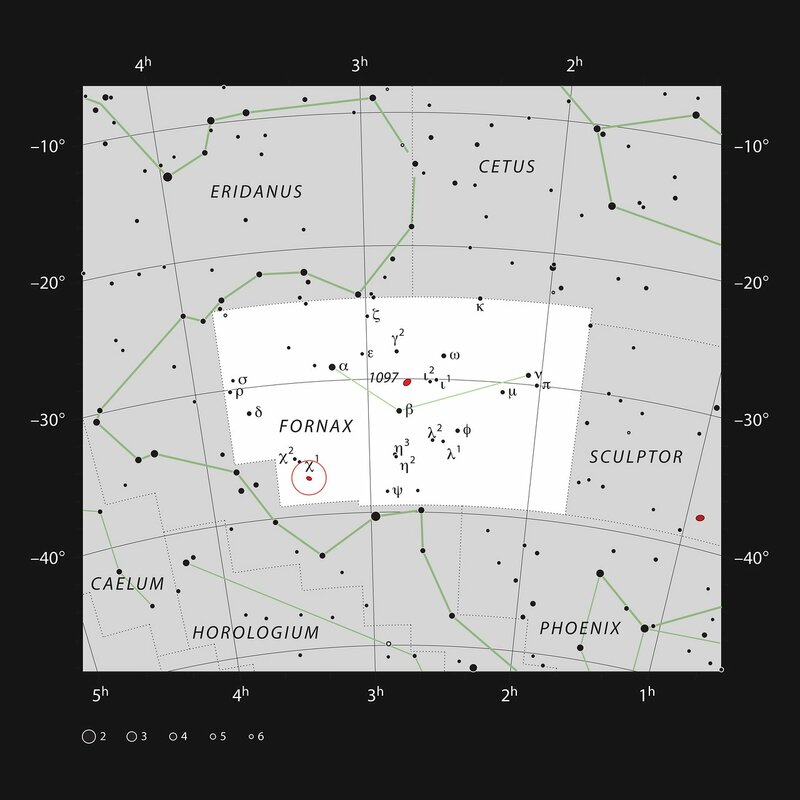 This research was presented in the paper “The Fornax Deep Survey with VST. II. Fornax A: A Two-phase Assembly Caught in the Act”, by E. Iodice et al., in the Astrophysical Journal. The team is composed of E. Iodice (INAF – Astronomical Observatory of Capodimonte, Italy), M. Spavone (Astronomical Observatory of Capodimonte, Italy), M. Capaccioli (University of Naples, Italy), R. F. Peletier (Kapteyn Astronomical Institute, University of Groningen, The Netherlands), T. Richtler (Universidad de Concepción, Chile), M. Hilker (ESO, Garching, Germany), S. Mieske (ESO, Chile), L. Limatola (INAF – Astronomical Observatory of Capodimonte, Italy), A. Grado (INAF – Astronomical Observatory of Capodimonte, Italy), N.R. 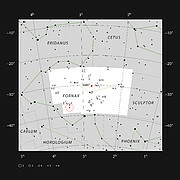 Napolitano (INAF – Astronomical Observatory of Capodimonte, Italy), M. Cantiello (INAF – Astronomical Observatory of Teramo, Italy), R. D’Abrusco (Smithsonian Astrophysical Observatory/Chandra X-ray Center, US), M. Paolillo (University of Naples, Italy), A. Venhola (University of Oulu, Finland), T. Lisker (Zentrum für Astronomie der Universität Heidelberg, Germany), G. Van de Ven (Max Planck Institute for Astronomy, Germany), J. Falcon-Barroso (Instituto de Astrofísica de Canarias, Spain) and P. Schipani (Astronomical Observatory of Capodimonte, Italy).